StarVest Partners has chosen to highlight the following trends in its investment thesis. 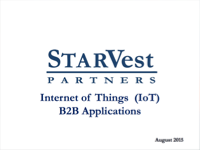 Excerpts of StarVest’s presentations on these trends can be found below. At StarVest’s Annual Meeting on Tuesday, October 25th, we were pleased to host a roundtable discussion featuring keynote speakers Peter Weed, Global Co-Head of McKinsey’s Growth Tech Practice, and JC Goodrich, Partner in McKinsey’s Growth Tech Practice. McKinsey Growth Tech is a division of McKinsey that can be flexible and nimble in working with earlier stage companies while bringing in the insights and resources of “Big McKinsey.” As part of McKinsey’s Growth Tech practice, Peter and JC lead the firm’s knowledge development focused on growth stage SaaS/XaaS companies and investors. SaaS Radar – private database of 150 SaaS businesses. Sales DNA – research project of >500 SaaS sales reps marked on 77 attributes. CCAT – scorecard of 40 SaaS businesses graded on commercial capabilities. Public Markets – analysis of all public software companies since 1980. Client Work – aggregate finding from work with >100 clients since 2014. The goal of the presentation and discussion was to highlight the importance of strong sales growth and sales efficiency in valuation determination and other best practices and performance targets. 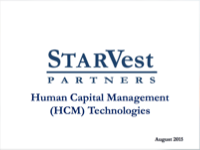 Contact info@starvestpartners.com for presentation notes.